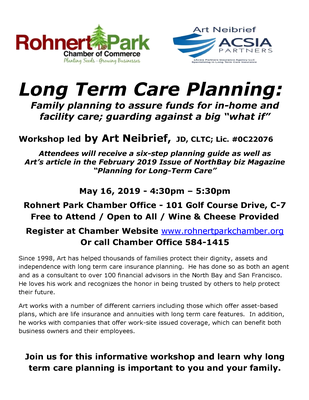 Join the Rohnert Park Chamber of Commerce for a free workshop presented by Art Neibrief, JD, CLTC, CA license #OC22076. Long Term Care Planning: Family planning to assure funds for in-home and facility care; guarding against a big 'what if'. Attendees will receive a six-step planning guide as well as Art's article in the February 2019 Issue of NorthBay biz Magazine 'Planning for Long-Term Care'. Click here for the Long Term Care Planning article.